I was in South Africa for two weeks last month and one of the activities my hostess thought I might enjoy was a day out at Lion Park. 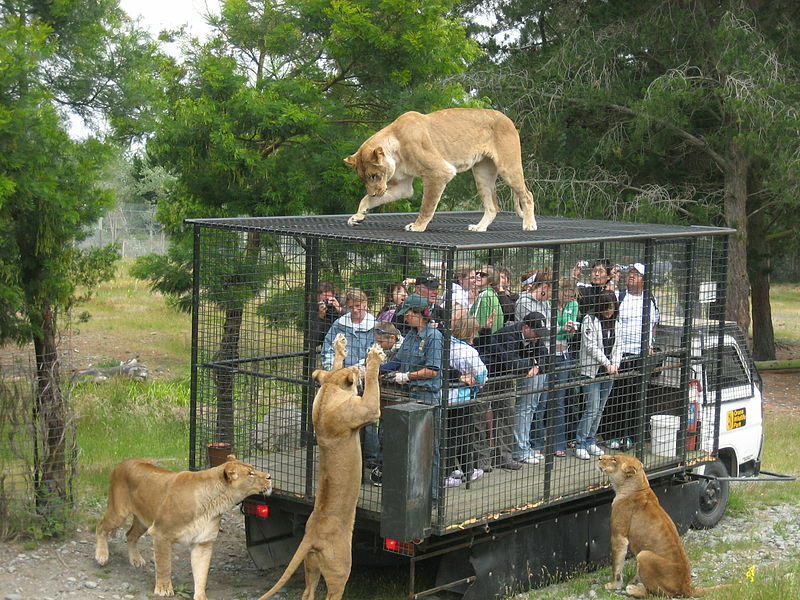 It took one look at the pamphlets at the hotel where people were in cages and lions roamed free for me to decide that was not my idea of fun. 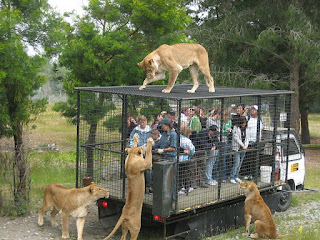 The concept of zoo for me whilst I am no proponent of taking animals out of their natural habitats to be imprisoned in cages for human-being to gawp at, is that at least there is enough of a barrier between me and the wild animal if I am ever in close proximity to it. What has become disturbing is the sense with which people visit animal or safari parks and suddenly forget that most of these animals are not tame, docile or harmless. This reminds me of a young man who won a competition to be a park ranger in East Africa from the UK. Whilst walking through the bush, a venomous snake spat at him and that hit his shin. Rather than leg it at the rate that would break a world speed record, he bend down to wipe the venom off his shin and the aggressive snake lurched him, biting his face, leaving him with lost sight in one eye and 50% loss of sight in the other eye. He returned home to sue the adventure company, though, beneath the veneer of the pity and sympathy that I had for him, I could not ignore his foolishness. Almost 18 months ago, it was the case of an elephant in Kruger Park, charging a car and toppling it. Now, three days ago, an Emmy award-winning editor on the Game of Thrones was mauled to death by the king of the jungle in Lion Park. She rolled down her window where instructions clearly state customers must never do so and the lion got her. Cute as a lion cub or any wild animal might seem on television, even from afar on safari, they are no respecters of persons and your vehicle or cage only provides enough protection if you follow all the safety notices to the letter. And whilst a majority of those who go on safari to see wildlife do return home safely, one cannot ignore the fact that a few never do or when they do, they return with radically life-changing experiences that leave an indelible mark on them. Africa, vast as it is with all its nature and wilderness is no playground, much as the Australian outback is no walk in the park. The animals out there can be dangerous, aggressive, predatory and lethal, a close encounter with these animals might well be a very last encounter in life. There is no reason why one’s story should become a tragedy because of some foolishness or stupidity, and that is the cause of many of these preventable attacks, injuries or deaths. If animals kill in the wild, there is no court to charge them for manslaughter or murder, they would have acted naturally as supposedly smarter human beings would have acted stupidly. One will not expect that animal to be put down, but we can afford the victim the dignity of a burial if anything is left of them. One is saddened to have to write this, but the truth must be told and reiterated. When out in the wild, take every precaution to ensure you do not become another story of the wild having you for dinner.